Edward writes: Today was mite autumnal with the temperature expected to be no higher than 15C but bearing in mind it's the second half of October nothing to complain about. 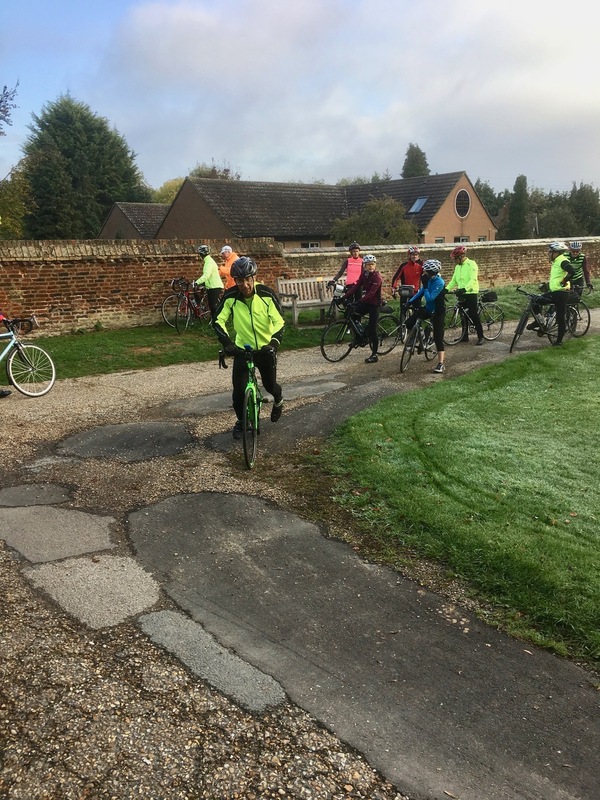 Our ride today would take us to Swavesey, (a favourite) and then to St Neots with an expected distance a regulation 55 miles, and once again Sharon was leading. When we left Haslingfield there were eighteen riders but before long this had increased to twenty-one - some turnout. This meant splitting up and it seemed that we had three groups on the go which should have satisfied most people’s speed requirements. We went a familiar route out through Harlton, Eversdens, Kingston and Bourn but after crossing the St Neots old road to go through Knapwell, instead of the usual turn up to Boxworth, we through to Connington and Fenstanton which fooled a few people. So from Fenstanton we went through Fen Drayton before arriving at the Swavesey Chapel shortly after 11 am. Although there had not been much wind what there was came from the north east and certainly had a bracing nip about it. As expected we found the chapel doing a roaring trade and this week it was on behalf of St. Andrew’s Church. Among the throng, of course, were Dr. John's City Slickers (didn’t get their numbers) plus numerous ‘independents’. After the usual delicious cakes and drinks it was the "city slickers" who who got underway first followed shortly afterwards by Sharon and most of the rest leaving a ‘rump’ to follow a bit later after a puncture had been repaired. Mike at work here. Once we got going it was down the busway to St Ives and there we made a mistake and took the road to Fenstanton whereas the correct route should have been to the Hemingfords. On the ride from Fenstanton to Hilton we had a chance to use the new bridge over the new A14 along with its cycleway. 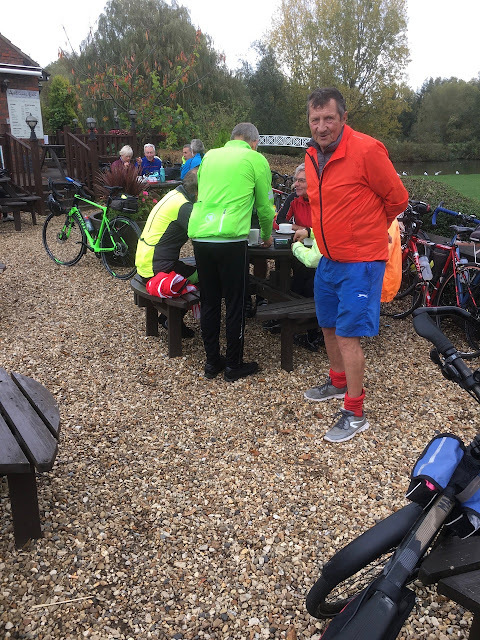 Hilton and Graveley followed then the long haul through Toseland to the B1043 and the final run-in to St Neots and as we entered the town Sharon and her group were just ahead, thus we all arrived at the Ambiance cafe together. The city riders had intended to eat at the Wetherspoons pub but there was nowhere to park their bikes so that was abandoned in favour of the Ambiance. Most people ate outside and by 2pm we were ready to leave again and unusually for a ride home Sharon had fourteen domestiques. 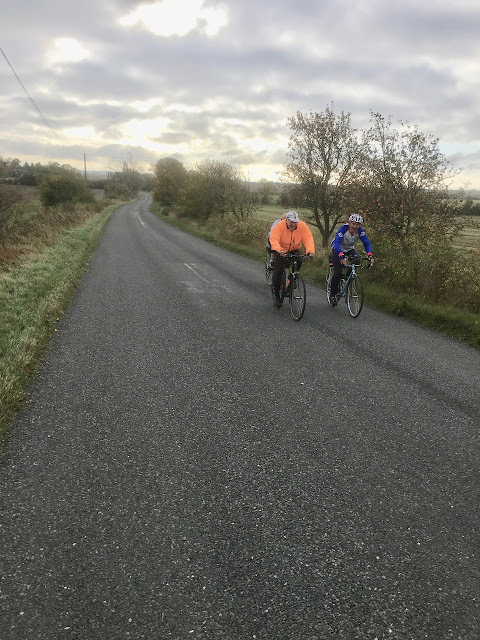 With the wind more favourable for us progress home was made at a steady pace, passing through Abbotsley, Great Gransden, Caxton, Kingston where we found the group at the front dealing with a mechanical problem on one of the bikes, and Bourn. After Bourn the group split with some going into Cambridge with the remainder heading back to Haslingfield with the ride finishing at 3.30pm and, as predicted, 55 miles. Thanks to Sharon, who frequently takes the helm, for making a fairly routine ride have a surprise or two.